Bioship 602 DBK Diagnostic Bag Kit has an airtight pressure biohazard bag (secondary container), complete with absorbent, instructions, and outer fiberboard box. This package system meets all requirements of IATA/ICAO Packing Instruction 650 for air shipment, and all requirements of domestic and international regulations for ground transportation of diagnostic specimens. This kit is for the customer that needs to ship many primary receptacles in one compliant diagnostic specimen shipper. The box measures 7.5" x 4.5" x 4" and 8.5" on the inside of the box from corner to corner. The shipping carton for a case measures 20" x 17" x 14". The 95kPa bag is 6" x 9". 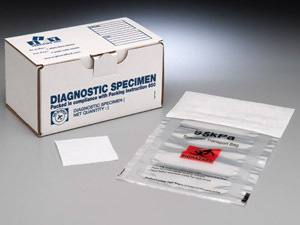 Meets the requirements of IATA/ICAO Packing Instructions 650 for shipping Diagnostic Specimens by air, as well as CFR 49 § 173.199 for ground transportation of these items. Secondary container passes 95kPa test. Secondary container is disposable, 1 time use only. Secondary container holds many primary receptacles. Outer packaging is marked with all regulatory markings, including the newly required UN3373 marking. Pricing listed is per case and there are 24 assembled kits per case. Additional discounts are available for larger quantities, please call for pricing. Add as many items to your Keika Ventures quote request as you like. When you have found all your items, go to the Quote page and submit your Request-A-Quote. We'll send you a detailed quote including shipping costs and a payment link so that you can complete your order. Copyright © 2018 Keika Ventures, LLC. All rights reserved. Keika Ventures is a woman-owned business.